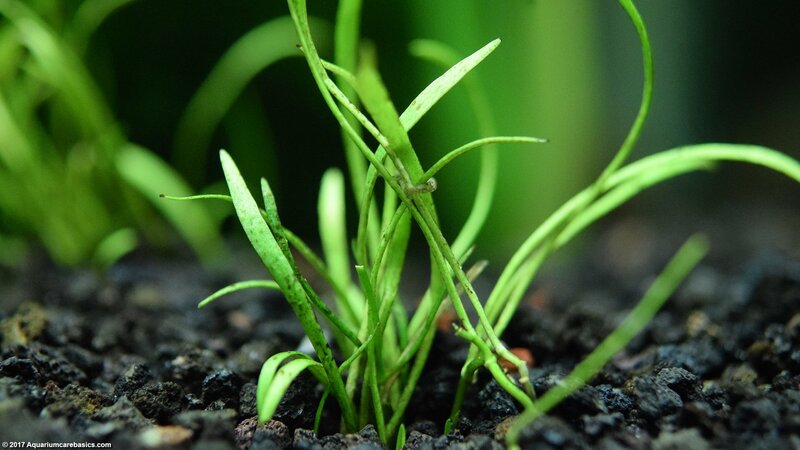 A Micro Sword Plant is a freshwater aquarium plant often found in pet stores today. 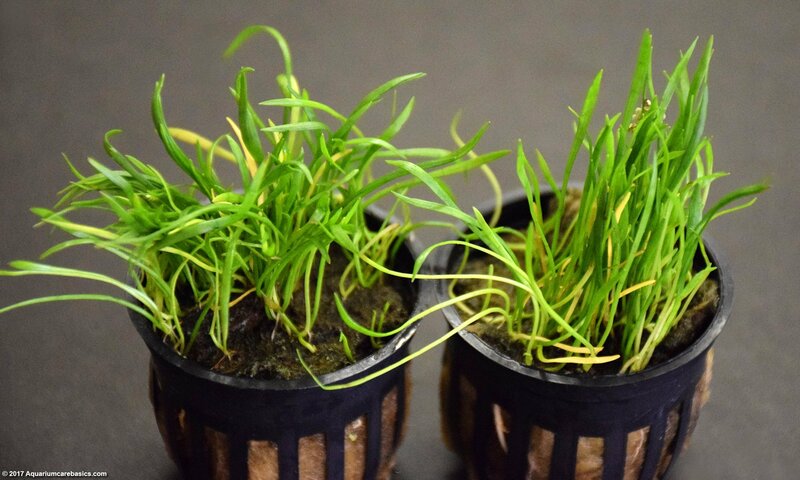 Often sold as a Micro Sword, it can also be called Micro Sword Grass, Brazilian Micro Sword, Copragrass, Carpet Grass or Lilaeopsis brasiliensis. A Micro Sword Plant is a foreground plant. What Should I Look For When Buying Micro Sword? Where Can I See Micro Sword Pictures? How Challenging Is Micro Sword Care? What About Planting Micro Sword? How Does A Micro Sword Reproduce? My Micro Sword Leaves Have Algae Growth On Them? 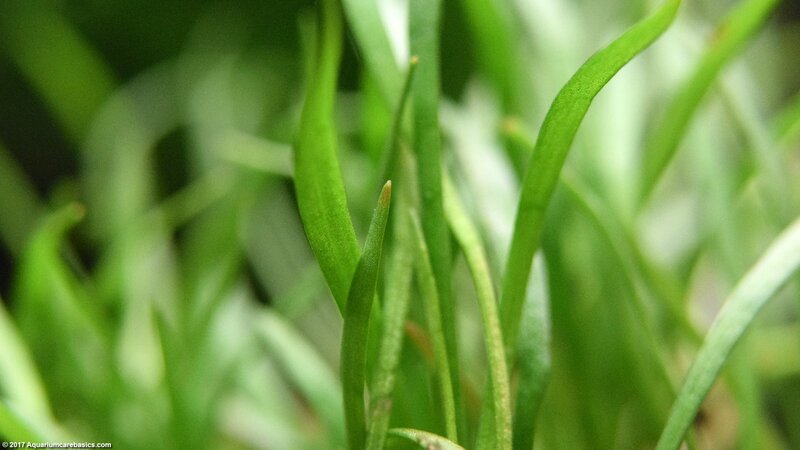 When buying a Micro Sword Plant its good to look for plants that have healthy, vibrant green leaves. The leaves should be about two inches long. Avoid plants with leaves that are yellow, cracked, torn, have lots of dead tips, or are otherwise damaged. Also try to avoid plants that have visible amounts of algae. 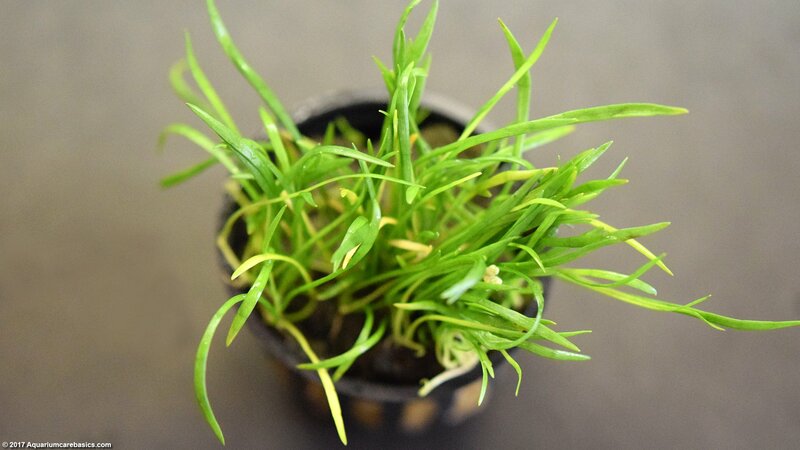 A Micro Sword Plant is often sold as a potted plant so its difficult to look at the plant’s roots in the store. But generally, if the leaves look healthy in the plant pot, then its a pretty safe bet that the roots are in good shape too. A Micro Sword Plant may also be available as a mat, like a swatch of cloth cut from a bigger piece. In that case it easier to have a look at the roots. Aquarium pH: 6.8-7.5, although some suggest a wider range on the acidic side. 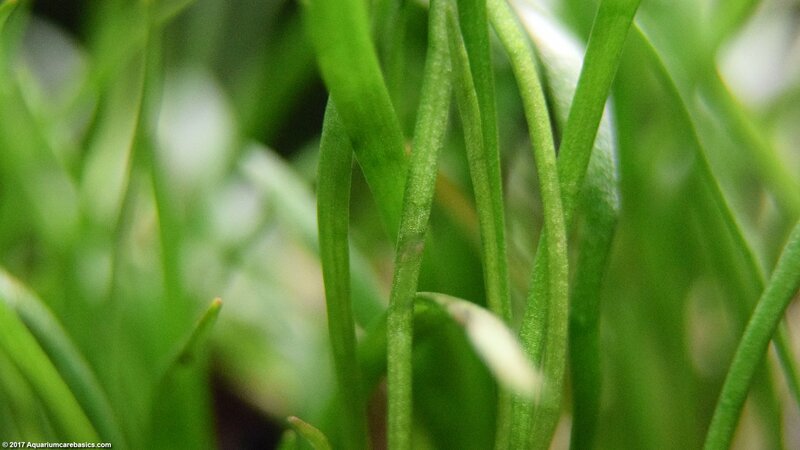 Good Micro Sword care requires rich, fertilized plant substrate as opposed to regular aquarium gravel. 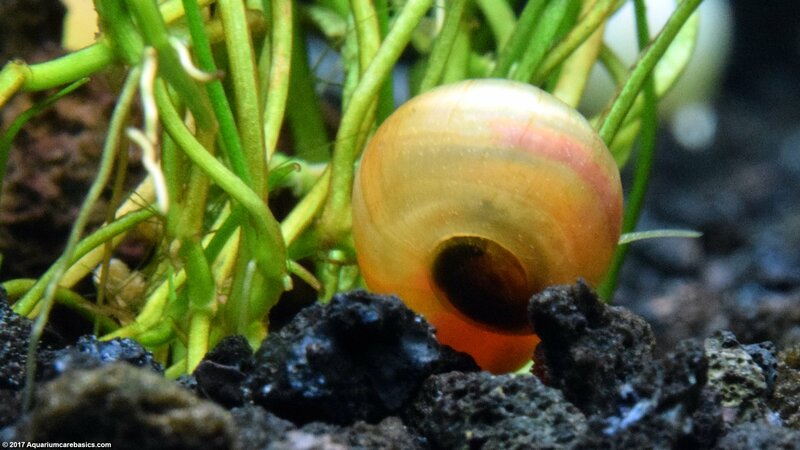 In low-tech tanks, growth rate will be slow, if at all. But in high-tech tanks with CO2 and strong lighting, a Micro Sword Plant can grow much faster. 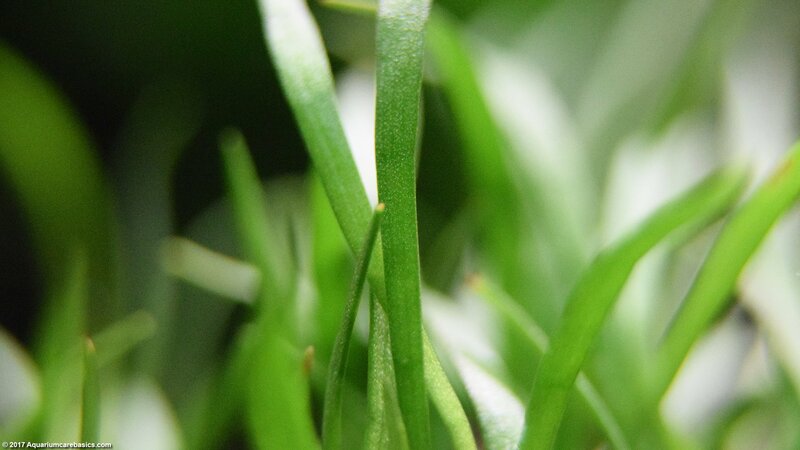 In the right tank, a Micro Sword Plant can grow to resemble a green grass carpet with leaves from about 2 inches long to about 5 inches. Healthy Micro Sword Plant roots are white, very fine and delicate. So be very careful not to damage or tear the roots when removing the plant from the pot or separating the plant into smaller clumps. Micro Sword Plant roots are not strong and durable like Anubias Barteri roots, especially when they are young. So its a challenge to plant properly. When planting a Micro Sword Plant, its tempting to adhere to the old adage “there’s safety in numbers” and plant the blades all in one clump. But this may prevent the plant from being able to grow out. The better approach is to gently separate the plant into smaller clumps and plant each clump about an inch or so apart in the substrate, about 1/4 to 1/2 inch down. Because the plants are light and have fine, shallow roots, they may come out of the substrate and float around. If this happens, plant them again. Hopefully patience pays off and the clumps will take root and stay put. 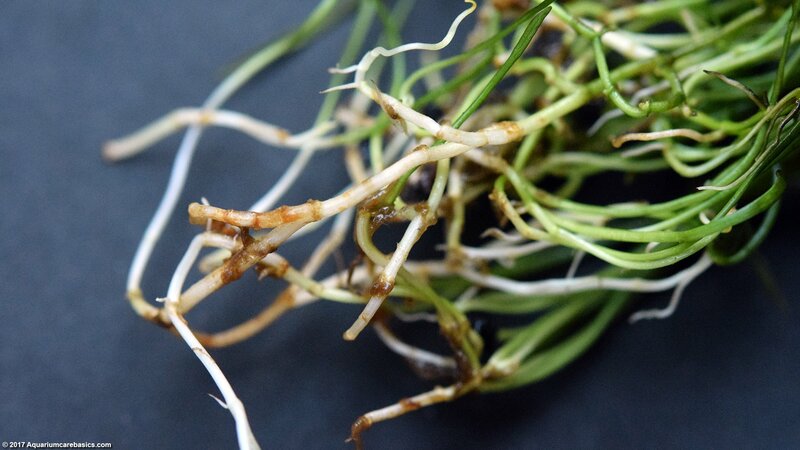 Once the plant roots establish themselves and the plant begins to reproduce, the roots will take hold like a net or web securing the plant to the top of the substrate. Reproduction occurs when the plant shoots little runners that come off the root portion of the plant. 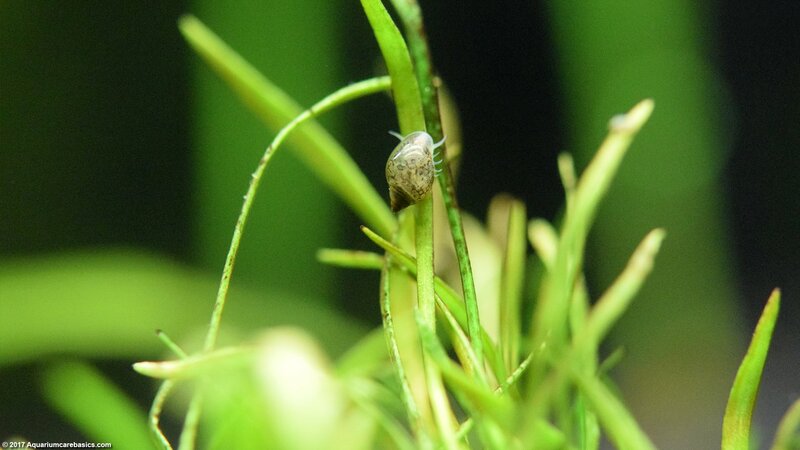 If planted properly, these little runners can grow new plants and create a spreading effect on the bottom of the tank. 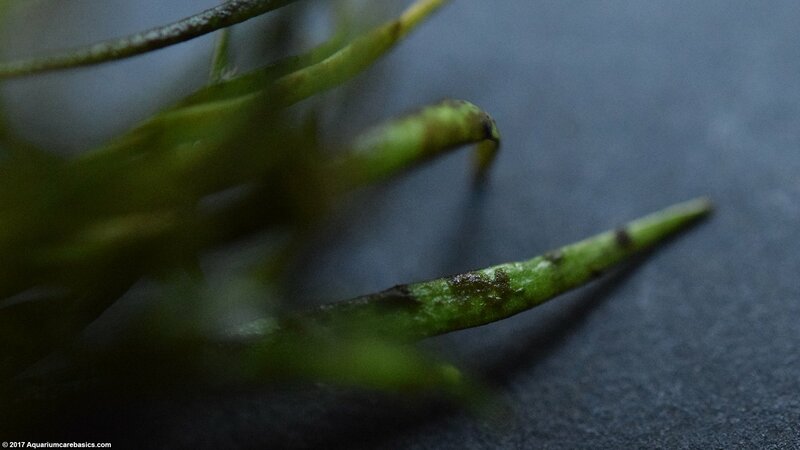 Because a Micro Sword Plant likes strong light and has a slow growth rate, algae buildup is likely to occur on the leaves, making them look unhealthy and brown. One of the ways to help minimize this is to not plant in one large clump. The large clump approach can slow down water movement around the plant giving algae growth time to establish a foothold. 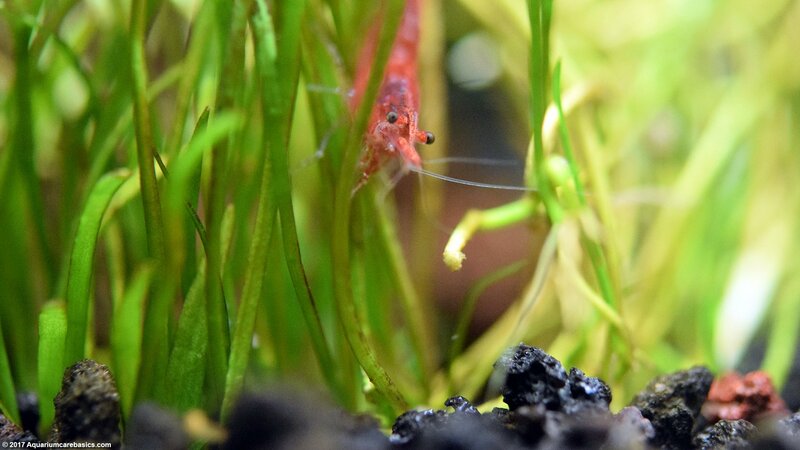 Another way to help combat algae buildup is to have some Red Cherry Shrimp or Amano Shrimp to help keep clean off the leaf surfaces. And as always, its important to make sure that water conditions are kept within proper ranges, and regular partial water changes occur.